Luka Modric landed the individual honour last night. 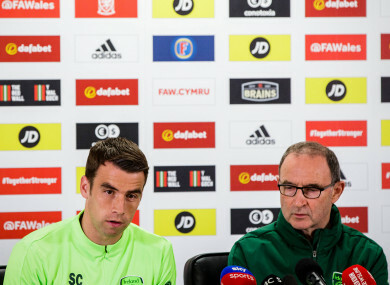 Ireland captain Seamus Coleman and manager Martin O'Neill. CROATIAN STAR LUKA Modric was last night crowned Fifa’s best player of the year with Ireland captain Seamus Coleman backing the winner in his vote for the award but the Real Madrid midfielder did not feature in manager Martin O’Neill’s top three. Modric was Coleman’s first selection ahead of Cristiano Ronaldo and Lionel Messi. O’Neill gave his first vote to Messi with Ronaldo in second and Liverpool’s Mohamed Salah in third. Irish media representative Philip Quinn chose French World Cup winner Kylian Mbappé ahead of the Real Madrid duo of Raphael Varane and Modric. England boss Gareth Southgate, Welsh manager Ryan Giggs and Welsh captain Ashley Williams all voted Modric as their number one as well. Salah got the top vote from Northern Ireland boss Michael O’Neill, his team captain Steven Davis and Scottish manager Alex McLeish. England captain Harry Kane went for Ronaldo as his number with Scottish captain Charlie Mulgrew choosing Kevin de Bruyne. Full details here on the breakdown of votes. Email “Here’s how Martin O’Neill and Seamus Coleman voted in Fifa's best player of the year awards”. Feedback on “Here’s how Martin O’Neill and Seamus Coleman voted in Fifa's best player of the year awards”.